Another great summer day and news that yesterdays Wood Sandpiper is still at Gilroy is tempered by an extensive list of chores that have to be completed before I get to visit what is becoming a regular haunt. I recieve some alarming news in the early afternoon. The Sandpipier has bitten the bullet! Taken by a Sparrowhawk! I am disappointed, but not for me and my photographic aspirations. I feel a bit sorry for the bird. Sentimental rubbish I know, loads of birds like this one won't survive the perils of migration, but I spent nearly 4 hours of my Sunday watching it and while not attached to it, I couldn't help but feel a bit miffed that it had become Sprawk food. While watching it yesterday I noted how when the other waders and the gulls on the water went up as the Sparrowhawk swooped in it stayed put, unconcerned by the possible danger. Was this lack of sense what cost it the end? I'm going to head up there anyway as Godwit numbers are up to 250 now with a colour ringed bird amongst that number. Another text. The Sprawk missed! 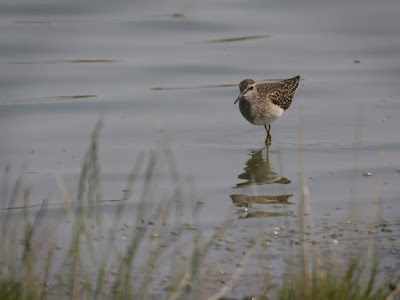 Wood Sand is still there! Bonus! Soon after I'm on the bike and heading up to Gilroy Nature Park. Scope up and there is the lucky Sandpiper. I watch it for a while as it strides around the muddy margins of the pool taking food from the surface. Next to it are 2 Snipe employing a different feeding strategy, probing deeply into the soft ground. As I watch it I notice that it seems to have learned it's lesson from the Sprawk experience. It is hugging the edge of the pool and the longer grass for long periods before venturing out into the open for a while before skulking back to cover. This bodes well for it's future! I turn my attention to the Godwits. 252 in all and many juveniles in that number. Finding the colour ringed bird will be tricky as they are in a tight flock. I wander down to the further gap in the hedge to change the angle and it works. ON-OR is back. I haven't seen it here since last Friday (13th Aug). Also present that day was GR-LX, a bird I last saw at the end of Feb on Thurstaston Shore. Nice to see it has made it back from Iceland. The flock seems more relaxed today. Many are roosting and a Blackbird alarm call leads to a flurry of heads appearing from under wings but they stay put on the bank. I stay another hour searching for other ringed birds but find none. I'm working tomorrow so it'll be an evening trip here. 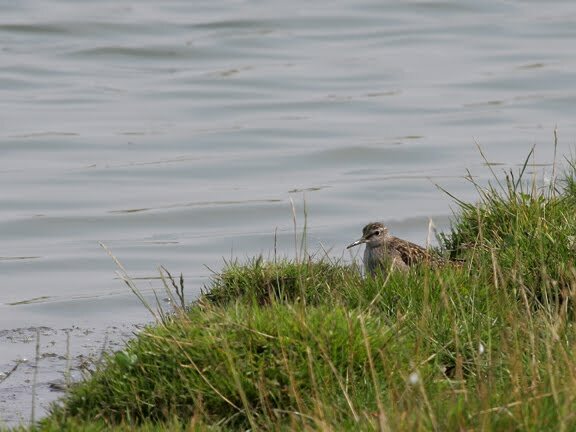 I wonder if the Sandpiper will still be here and how many Godwits I will count, tune in tomorrow to find out! Oooo. Good times my man! You've clearly had some decent birding whilst I've been away getting hammered lol :)Can't wait to hit the patch tomorrow and then make up for lost time over the weekend!